Starting this October, Dr Syed Adnan is joining the NIIM Clinic. 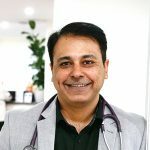 Dr Syed Adnan is an Integrative GP covering the whole spectrum of Mind Body Medicine with special focus on mental health, chronic fatigue, metabolic syndrome, weight and weight loss, and improving vitality motivation and drive to live and prosper. Syed believes that diseases can manifest from a variety of aspects in our lives including diet, genetics and lifestyle factors (which modulate how our genes are expressed), and that if we treat our food as medicine, we may not need any medicine. This perspective underlines his approach of treating not diseases, but patients and their lives as a whole. He encourages his patients to use every episode of a diseased condition as an opportunity to understand what went wrong and how could this be prevented in future. At a personal level, he is friendly and easy going. His patients have always enjoyed a very professional yet cheerful rapport with him.